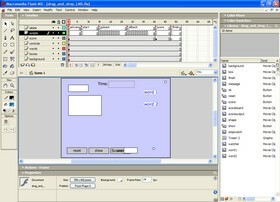 The LMS version of the drag and drop template is identical to the original in the way that it works and the options you can set to control it. Therefore, this part of the tutorial does not include how to adapt it. You might want to go to the drag and drop section to revise how it works. Actually, that's pretty much all you have to do before designing the activity. However, there are some settings that seem to work better with an LMS. I suggest that you scroll down the window and set the following variables, at least for your first project. This ensures that the user sees the raw score rather than a percentage. This is because, on completion, the movie sends the raw score to the LMS. This value ensures that the score is calculated as the user does the activity and the score is sent to the LMS as soon as they complete it. The alternative (= 1) means that the movie waits until the score button is clicked. 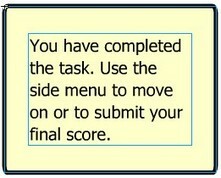 If the user forgets to do this before submitting the task, the LMS might not get the score at all. All the other variables are up to you and the flavour of activity you want to design. 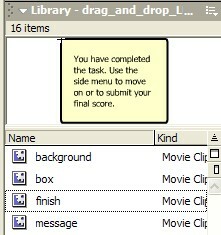 The only other addition to the basic template is a message that is displayed when the task is completed. If you happen to be into that geeky stuff and want the challenge of inserting the movie into a package using a different content design application, you will need to alter one line in the completeLMS() function at the end of the code on scripts frame 1. Did I mention that eXe is free and does all this stuff automatically?